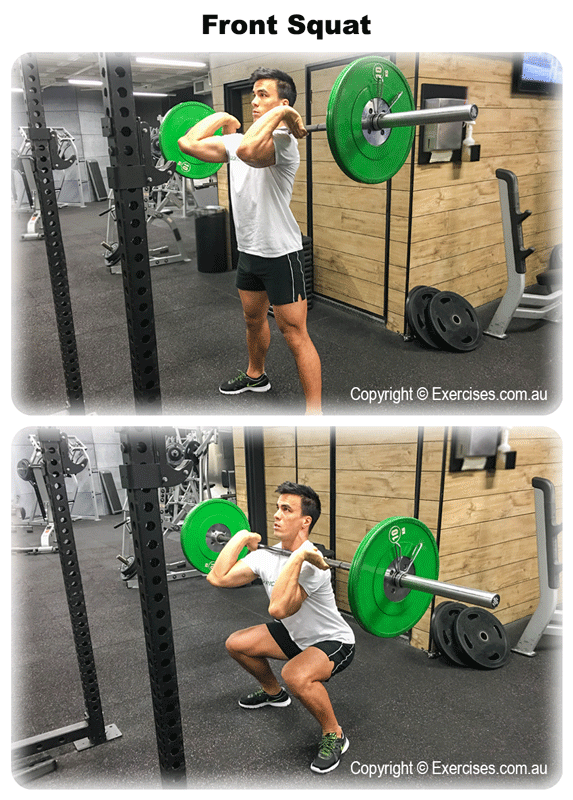 Front squat is a fantastic compound exercise that primarily targets the quadriceps and posterior chain as well as calls the core and upper body into play. When done right, the front squat will improve strength, muscle growth and explosive power of the lower body, while also helping to burn fat and increase your resting metabolic rate. For safety purposes, perform this exercise in a squat rack. Set the bar at an appropriate height and then bring both arms up and under the bar, keeping your upper arm slightly above parallel off the floor. You can use an Olympic grip or keep arms across the body. Un-rack the bar, allowing it to rest on your front deltoids (shoulders) and upper chest. Keep the chest up and maintain a straight torso. Take 3 small steps back to get into position. Position feet shoulder width apart, toes slightly pointing outward to the sides. Take a deep breath in and hold it. Now, breaking with the knees and then the hips, lower the bar until the thighs are parallel to the floor or lower. Keep the head up, back straight and begin to rise back up to the starting position. As you are ascending, exhale and return to the starting position. Ensure that your head is up and maintain an upright posture at all times. Keep the core tight and make sure that the knees track over the feet. The path the bar takes should be a straight line from start to finish.